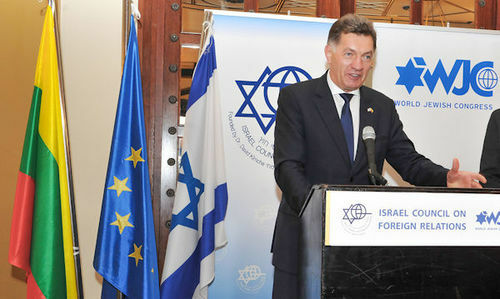 Addressing the gathering after his talks with Israel’s Prime Minister Benjamin Netanyahu, Butkevičius stressed that he was “pleased with the excellent cooperation” between Israel and Lithuania in many fields. The Lithuanian leader was accompanied by a delegation that included Deputy Foreign Minister Neris Germanas; Government Chancellor Alminas Mačiulis; and Lithuanian Jewish Community head Faina Kukliansky. Asked about whether the Lithuanians would admit Syrian refugees, he said that his government had decided to accept 342 people but was considering granting sanctuary to more. However, Butkevičius added that Europe had to “fight the causes, not the consequences” of the refugee crisis. ICFR board member Prof. Shlomo Avineri, who chaired the event, welcomed the prime minister by saying that the Lithuanian leader had come “from Vilnius, the ‘Jerusalem of Lithuania’, to the real Jerusalem.” Avineri stressed that Lithuanians and Jews shared a common history, which at times constituted a heavy burden. “Today, we can recognize, understand and transcend that history,” he said. He urged Butkevičius to facilitate contacts and cooperation between universities in the two countries in order to further that goal. In 2014, the WJC’s Yiddish Center aimed at contributing to the preservation of the Yiddish language and culture was established in Vilnius. Since then, some 2,000 people from around the world have participated in its programs.